I’ve been working on camera hacks for a couple of year now. 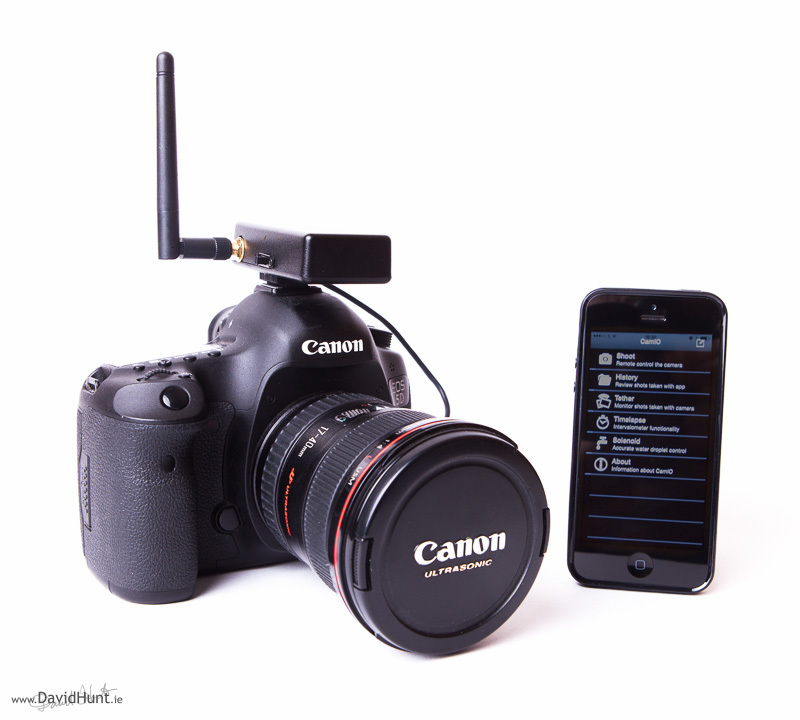 It started with the CameraPi, which was a Raspberry Pi mini-computer stuffed into an old battery grip for my Canon 5D Mark II Camera. Then came various variants on that, including a DIY time-lapse rail, the results you can see in the time-lapse section of this website. Theres’ also some water droplet photography, automated focus stacking, and even a bark activated door opener, not to mention the PiPhone. a 1200 mAh Lithium Polymer battery. Based on initial quick measurements of the current draw, I reckon that the battery will last for about 8-10 hours on a charge. For this initial prototype, I have a DC-DC converter in there to convert from the LiPo’s 3.7 v to 5V, so that I can feed in the power to the ‘external’ power input on the Edison board. 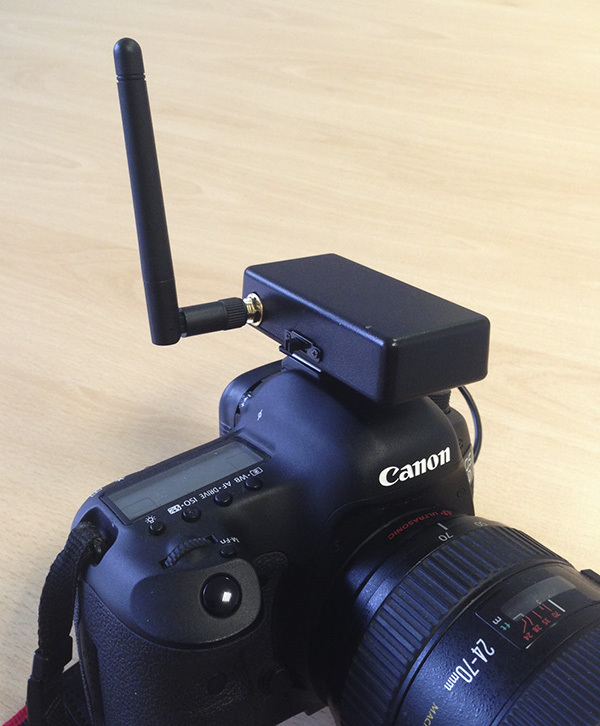 The breakout board can take a battery directly, but then the USB port will not work in host mode, which I needed for connecting the DSLR. The DC-DC converter allows me to get around this limitation, and it still all fit into the small box. 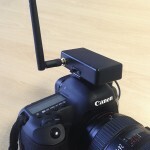 The USB OTG cable was needed for the connection to the camera, but the usual ones had a large usb connector on the end, into which you can plug another cable. That was too bulky ( and not very nice looking) for what I needed, so I split apart a couple of regular USB cables and made my own OTG cable by shorting pins 1 and 2 together. Much neater than an off-the-shelf solution. 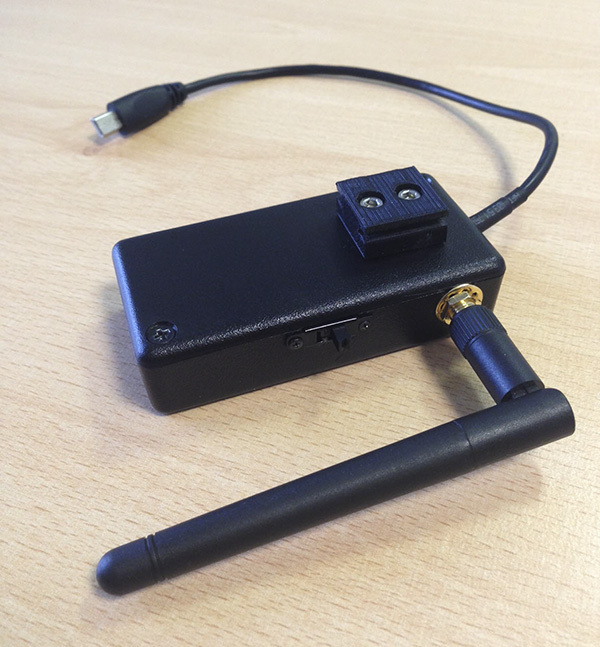 The antenna pigtail goes straight onto the U.FL connector on the Edison, and out to a standard 2.4GHz whip antenna. I didn’t necessarily need this, as there is a WiFi antenna built into the Edison PCB, but for the sake of much improved range, I added the external one. And I don’t think it looks too bad. The bolts are just the right length so as not to stick up past the nuts in the bottom of the case, and were covered with thick tape so as not to cause any electrical problems with the other components in the case. I’m using a custom iPhone app connected into server software running on the Edison which can control the camera, get thumbnails, get images, and do all sorts of stuff with them. 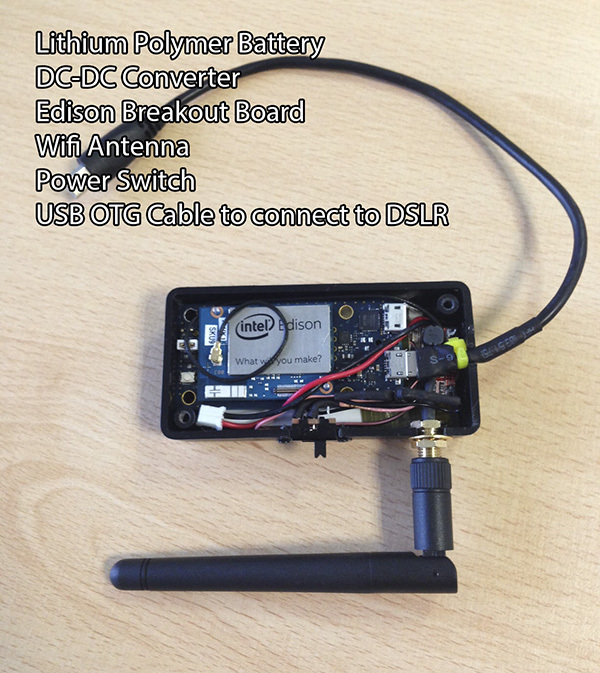 I presented this to the guys at work a couple of weeks before the European Maker Faire, and they took such a liking to it that I ended up showing it on the Intel stand at the Faire, along with another project we’d put together, which was a Timelapse Rail controlled by an Intel® Edison Arduino baseboard controlled via iPhone app. Your project looks great. The Edison Breakout Board edition lacks plenty in the documentation department. Would you be willing to exchange a few emails on getting through the initial setup? I too (like Randy) am a pro photog in the U.S. working mostly in fashion and portraiture. 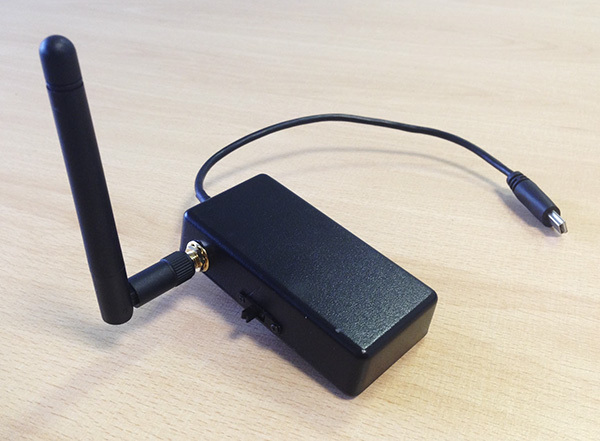 Are you continuing work on wireless or ethernet file transfer? Mainly large file (RAW) image movement over wireless or wired connections? Possibly a localized, dedicated WIFI network? Great work by the way…. I applaud your vision and knowledge! Can you share details on the source of the case? I’m trying to find a place to store my edison in a similarly sturdy container. Very nice! Look forward for how to doc. How do you communicate with the app, bluetooth? 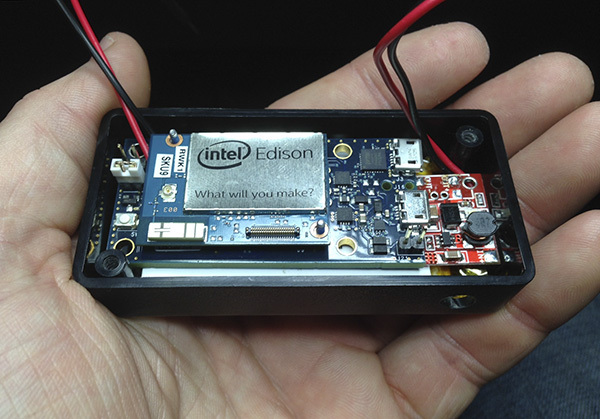 Previous Previous post: Raspberry Pi, Beaglebone Black, Intel Edison – Benchmarked.